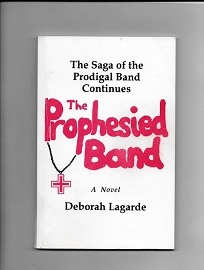 Right now I am working on turning my printed books, Battle of the Band and The Prophesied Band into e-books. That is, they need to be formatted for e-book purposes and sold through e-book outlets (several, in fact, not just Kindle or Nook.) That is, I have to re-type them! My printed books in 1995-6 and 1997-8 were formatted for ancient floppy discs on an ancient Macintosh LC475 computer using Mac OS 7.5! Both Mac computers (mother was an early PowerMac with Mac OS 8), both desktops, have had their hard drives removed and sold as scrap. Since I can no longer access these ancient computers (I now have a laptop with Windows 7, and no floppy drives anyway! ), I am re-typing both books. Hopefully, Battle will be finished by the end of the year –and keep in mind, I have to format it according to specifications of the book seller, including a table of contents and a new cover. Why? Because multiple people want me to do this, and because since I live way out of town it is not easy to go into town every time I have to send out one of my printed books. Our Post Office keeps weird hours, the price of gas is high in these rural areas, and my vehicle right now is not in good shape! Here, and on my book blog, I will as soon as possible post articles about not only the characters and the story itself, but the factual events and historical narratives that these books are based on and drove me to write them. 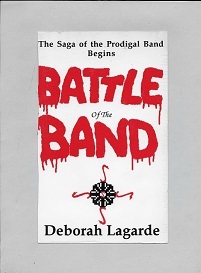 As I am re-typing Battle of the Band, I am realizing just how satirical it is! Since I’m not really into genres, the genre of “satire” might work for this one: genres–satire, horror, spiritual, adult. But not “adult-adult” if you know what I mean. And I am taking out all the “f”-words if you know what I mean. The “s”-word is staying. My characters are my characters, right? Folks, I’ve never met a man who didn’t cuss–ever Christians cuss a lot!